If you’ve been reading regularly you know I had buckets and buckets of apples to use up last autumn. Pounds and pounds of them. I know, woe to me. Many of those apples made it into desserts such as Apple Brownies, Yogurt Apple Cake and Apple Banana Bread with Roasted Hazelnuts. But even more of them ended up peeled, cored and cooked into apple sauce that is now buried in the depths of our deep freeze. Cleaning out the freezer the other day, I stumbled upon this cache of apple sauce and decided it needs to get used up to make room for the many peas and broad beans I’ll be freezing in a couple of months once spring has finally arrived. In my quest to use up apples, I’ve found a very efficient recipe: The Triple Apple Cake. 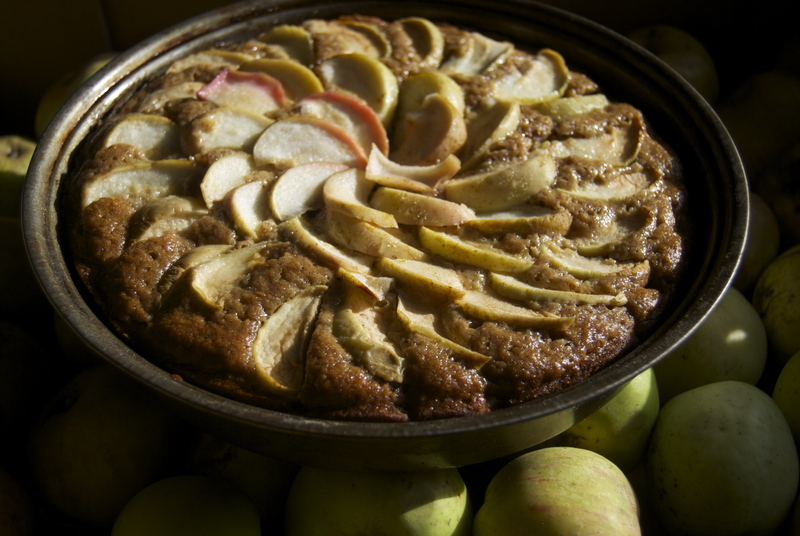 A cake that is light on the oil and sugar because it is so heavy on the apples. Apple sauce makes it moist, apple cider boosts the flavor, and sliced apples on top make it texturally interesting. In a large bowl, mix together the oil, sugar, eggs, vanilla and apple cider. Once the mixture is smooth and free of lumps, mix in the apple sauce. In a separate bowl, sift together the flour, baking powder and soda, salt and seasonings. Slowly add the dry ingredients to the wet ingredients, taking care not to overmix. Pour the batter into a greased 25 centimeter (10 inch) cake pan. Slice the apples into thin slices and arrange them as you please over the top of the batter. Sprinkle 2 tablespoons of sugar evenly over your apples. Bake for 30 – 35 minutes or until a cake tester inserted into the middle of the cake comes out clean. Oh, my–your father would dive into that stuff head-first! He loves apples even more than potatoes (aka, “apple of the earth”)! Thank Bernice! So does your Irish Guiness stew! And where’d I get that from, pray tell?